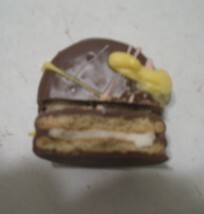 A half dozen delicious Golden Oreo's covered in creamy chocolate of your choice. Great for children to take to school for parties or as a special something in their lunch! These chocolate covered Oreo's also make excellent place setting pieces for dinner parties! 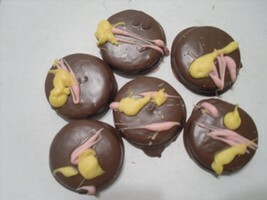 These have been drizzled, splattered, and dolloped with white chocolate flavored yellow and pink chocolate for spring! These are available in chocolate, white chocolate, dark chocolate, mint chocolate, and mint white chocolate. Please specify which flavor you would like when placing your order. They can be any color (red, yellow, pink, green (light and dark), orchid, orange, blue (light and dark). They are always packaged with care! Each Oreo is individually wrapped. Also available with season or holiday appropriate candy sprinkles. Please specify in your buyers notes!